The tour program starts in Cairo (Day 1): Sundays, Wednesdays or Fridays Cruise departures Monday, Thursdays or Saturdays (depending on the ship). Extra days can be added. Arrival to Cairo airport, our representative will assist you through passport control formalities, luggage identification & portage will greet you. Excursion tour to visit the Step pyramid in Sakkara (Sakkara (Saqqara) is one of the most extensive archaeological sites in Egypt! It was the cemetery for Memphis, the capital of Ancient Egypt, yet it is still one of the virgin archaeological sites, despite the fact that so much has already been found here! The site is dominated by the Step Pyramid of King Zoser, which goes back to 2700 BC. It is one of the oldest stone structures in the world!). Then visit the cemetery for Memphis (Founded in the 1st Dynasty (3100 B.C) by King Narmar, Memphis was the capital of Ancient Egypt, and the first capital city founded after the unification of Upper and Lower Egypt. It remained as the capital of Ancient Egypt throughout the Old Kingdom. Because of the many necropolises associated with Memphis, many Egyptologists believe that it was once an extremely large city, though no archaeological evidence proves this, at present! ), then we will visit the papyrus institute, then a visit to one of the Seven Wonders of the World: the Pyramids of Giza (Cheops, Chephren and Mycerinus), Cheops is the most colossal ever built. Next is a close-up look at the sphinx - a huge funeral complex guarded by the legendary lion body with the face of king Chephren and The Valley Temple. At the end of the day we will transfer you to your hotel. Early morning transfer to Cairo Airport for departure to Luxor. Arrival, meet & assist by our representative and transfer to your Nile Cruise & Check in. Excursion tour to visit Karnak Temple, which is a serious of temples, built in different reigns. Starting by the Avenue of Sphinxes visit the Unfinished Propylon, the Hypostyle Hall with it's 134 gigantic columns, the Obelisks of Queen Hatshepsute and Tutomosis III, the temple of Amon adorned with lotus and papyrus designs, the Granite Scarbeus of Amenophis III and the Sacred Lake. Transfer to Nile Cruise. Afternoon tea. Dinner on board & Belly Dance show. Dinner & Overnight in Luxor. Breakfast. Visit the West Bank including: Valley of the Kings (Is a valley in Egypt where for a period of nearly 500 years from the 16th to 11th century BC, tombs were constructed for the kings and powerful nobles of the New Kingdom (the Eighteenth through Twentieth Dynasties of Ancient Egypt). The valley stands on the west bank of the Nile, across from Thebes (modern Luxor), within the heart of the Theban Necropolis. ), Colossi of Memnon (The two colossi are made of sandstone, which during ancient times was brought from Gabal El Silselah. Each colossus, including the pedestal and the crown, is about 21m tall and represents King Amenhotep III seating on his throne, wearing the Memes, or royal headdress, with the divine cobra protecting his forehead. On the sides of the colossi there is a representation of the Nile god Hapi, bending together the lotus and the papyrus plants, symbolizing the union of Upper and Lower Egypt) and Temple of Queen Hatshepsute (Hatshepsut was the fifth Pharaoh of the18th-dynasty who was one of the handful of female rulers in Ancient Egypt. Her reign was the longest of all the female pharaohs. Her funerary temple still stands as a tribute to her incredible rise to power). Lunch on board. Sail to Esna. Afternoon Tea. Disco Party. Dinner & Overnight in Edfu. Breakfast. Visit the Edfu Temple (Lies in Edfu town, 123 km north of Aswan on the west bank of the Nile. It dates to the Ptolemaic period. It was dedicated to the worship of god Hours represented as a falcon. It is one of the most beautiful Egyptian temples, distinguished by its huge splendid structure that blends Pharaonic and Greek architecture. Its grandeur competes with Luxor temples. It is the second largest temple after Karnak. It also houses the Nilometer and a huge pylon at the entrance). Sail to Kom Ombo. Lunch on board. 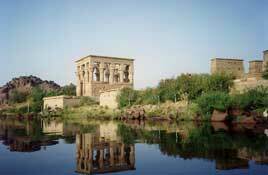 Visit the Kom-Ombo Temple (Located in Kom Ombo town, 45 km north of Aswan. It is built on a hillside overlooking the Nile. This temple was constructed in the Ptolemaic Roman era for the worship of god Haroeris and Sobek, the crocodile god. It is noted for relief engravings on its walls which show ancient surgical tools, bone saws and dentistry tools. Nearby there are three mummified crocodiles. They are now in Hathor's chapel). Sail to Aswan. Afternoon Tea. Dinner on board & Galabya party. Breakfast. Excursion tour to visit, Philae Temple (The Temple of Isis is one of the greatest Temples in Egypt and it occupies about a quarter of the island. It is the main Temple on the island, with its huge, complete, pylons and beautiful scenes), High Dam (One of the most outstanding architectural achievements of the twentieth century. It was constructed to replace the old Aswan dam built in 1902. The High dam was constructed to protect Egypt from the floods as well as providing irrigation and electricity all over Egypt. It is 3600 meters long. Visitors can easily locate lake Nasser which is a huge water reservoir) and Unfinished Obelisque (The beautiful red granites that were used in building the temples and monuments in the ancient days were brought from the quarries of Aswan. Now while you are on a trip to the Unfinished Obelisk you can see innumerable inscriptions in the area around the quarries. These are probably the descriptions of the various quarrying projects that were undertaken in the past days). Dinner & Overnight in Aswan. Breakfast. Disembarkation. Transfer to Aswan Airport for departure to Cairo. Optional: "Why not visit the colossal Temple of Abu Simbel built by Ramses II (XIXth Dynasty) and lately saved from inundation of the Nile waters in among the glories of ancient Egyptian monuments. The temples were built out of a sandstone rock cliff, and representation of the deities to which each was dedicated is carved on its huge façade. Nearby, also saved, lies the small Temple of the King's wife Nefertari, dedicated to the goddess Hathor". - 1 Night in Cairo at Selected Hotel on Bed & Breakfast Basis. - 4 Nights at 5 star Nile Cruise on Full Board Basis. - Cairo/Luxor & Aswan/Cairo by Egypt Air Flight. Christmas, New Years & Easter 2019 Special gala dinner supplement!